If Vermont’s Columbus Smith paid you a visit or sent you a letter in the mid-1800s, you were in luck. Smith was a treasure hunter, of sorts. He spent decades searching dusty English records in the hope of finding links to Americans. Why was this so worthwhile? Because when an Englishman died without heirs, the Crown simply pocketed his estate. There were plenty of solicitors who worked the same game in England itself. They would track down unsuspecting heirs and inform them of their good fortune. Then they'd offer, for a percentage of course, to reunite them with their rightful property. Winners all around. As a young lawyer, just graduated from Middlebury College in 1842, Columbus Smith visited England, apparently on behalf of a client. There he learned of the large number of abandoned estates in England. The potential was not lost on him. Acting on his observations earned the aptly named Columbus Smith a fortune from abroad, respect at home and a manor house in Salisbury, Vt. The house remains a landmark today. It stands as a monument to a gifted lawyer and entrepreneur who passed his wealth on to the needy of his hometown. Though Columbus Smith's classmates recalled him as an intelligent student, few would have imagined the future he set in motion for himself when sifting through papers in the English courtrooms. Upon returning stateside from his 1842 trip, Columbus Smith began exploiting his new-found knowledge, advertising his services. You could have a fortune due you in England, he told prospects. Not surprisingly, people with English ancestry took note. In 1844, he was approached by a family from New Jersey, the Rutherfords. The Rutherfords believed they should have inherited a substantial fortune. The family could not prove its ancestry, but believed that it traced back to a widow who had died intestate in 1821, Frances Mary Shard. The legend of Frances Mary’s story is this: While working as a waitress at the Black Horse Tavern near Trenton, N.J., in 1740, she met and fell in love with an Irish lord who visited the tavern. The tavern’s owner, Frances Mary’s Scottish father, forbade her from seeing him, and the two eloped. Her father broke off relations with her. The newly married couple traveled to England, where the groom’s family was equally unhappy with the match. As a result, the two rattled around Europe and eventually settled in Paris, where Frances Mary's husband soon died. In Paris, Frances Mary met her second husband, a wealthy, much older Englishman named William Shard. The two settled in the English coastal town of Paignton, and lived a life of luxury. Frances Mary lived out her life there, childless, and left no will at her death in 1821. It would be 1858—14 years—before Smith managed to pry loose her estate from the Treasury. Six trips to England and exhaustive research finally found the required documentation to connect Frances Mary to the Rutherfords of New Jersey. The estate, with interest owed, was reported to be worth $300,000, of which Smith received one-third. The Shard case was his most famous, and it helped establish his bona fides. It was far from his only case, however. Smith’s mailbox bulged with correspondence from individuals who wanted to find their lost fortunes. He was more than happy to assist for a fee or a share of the money recovered. [optinrev-inline-optin1]Family associations -- the Gibbs, Jennings and many more -- hired Columbus Smith to research their family trees to find possible missing fortunes. It was an era when many Americans were beginning to celebrate their ties to England, which brought a certain prestige. And if Smith’s research did not reveal monetary treasure, it did provide a proud genealogy for the purchasers. In these family association cases, members would agree to buy shares in any eventual recovery, with upfront money being used to underwrite Smith’s costs. Other, wealthier individuals, such as the Astor family, simply hired him outright. In at least one instance, he tried to work the strategy in the opposite direction. He attempted to recover land that the King of England had granted to a family, but which the commonwealth of Pennsylvania had confiscated. In 1868, with business booming, Columbus Smith took on a partner, A.B. Herrick of Burlington, Vt. Herrick would do much of the work in London. Together they would recruit families for their venture. The partnership also reflected the personal realities for Smith. In 1866, at the ripe age of 47, he had gotten married to Harriet Jones of Claremont, N.H.
By 1867, he had a son, William. Daughter Mary would follow in 1870. And with the family under way, he put in motion his long-held plans of settling in Salisbury. In 1872, at the age of 52 and only six years married, Smith began spending some of his fortune in earnest. That was the year he began work on his mansion in Salisbury. Built of ashlar marble from Cornwall, the Hmansion contained 30 rooms. Columbus Smith named the house after his most famous case, Shard Villa. Major construction of the house, the centerpiece of what eventually grew to be a 700-acre estate, was finished by 1874. 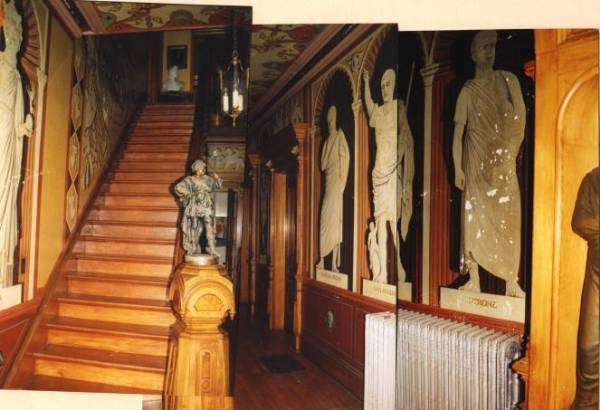 Work, however, continued well into the 1880s, when Smith brought Italian artist Silvio Pezzoli to live at the mansion while he finished frescoes that adorn its ceilings and walls. (It) …is a crowded stage-set of all the seventies held most admirable in painting, furnishings, and statuary. The walls and ceilings of the ground-floor rooms are completely covered with frescoes by Silvio Pezzoli (others report local artisans painted the frescoes). 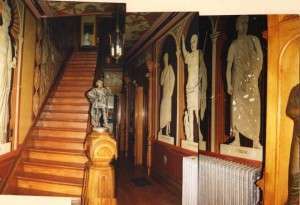 Caesar, Nero, Cicero, Romulus and Remus, and other Romans greet the visitor from the walls of the entrance hall…From every ceiling nymphs, cherubs, and graces gaze down at the marble busts, the heavy Victorian furniture, the Oriental rugs (the one in the dining room concealing an inlaid recumbent deer), and the elaborate mantels of marbleized slate. 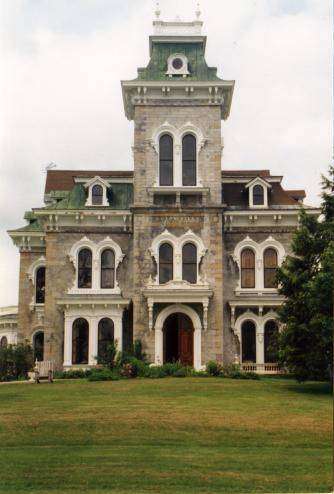 The mansion became a source of both pride and amazement for the residents of Salisbury and nearby Middlebury. Columbus Smith spent a reported $175,000 -- a sizable sum in its day -- on the mansion, which he built on the site where his ancestors had once lived in a log cabin. It served as both house and museum for the treasures he brought back from his frequent and extensive travels in Europe. They included curiosities from all parts of the world: relics from battles, coins, swords, arrows, heirloom pewter and flasks taken from ancient Peruvian rooms. The Rutland Globe, describing the interior, reported 36 different woods were used in finishing the interior and no two rooms were finished he same way. All had hot and cold running water. Smith fitted it out for family life, the article noted, with nurseries and a room for his aging mother, finished in butternut and black walnut. 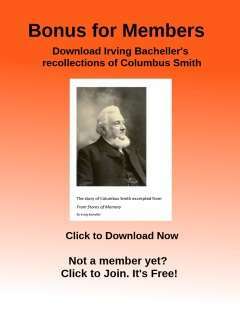 Columbus Smith set himself up to thoroughly enjoy the life of a country squire. He lived well, and his prosperity was generously reported in the Vermont newspapers. He served as director of the Brandon National Bank, and directed that town’s centennial celebration. Harriet served on fair committees and joined ladies groups. And his farm contained both livestock typical of the day as well as exotic bison. 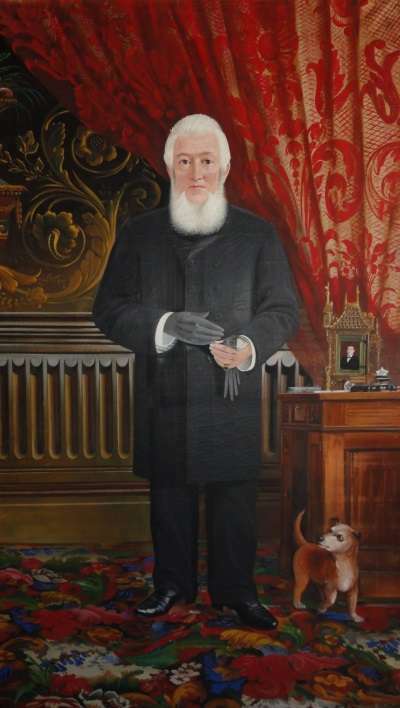 He hosted many prominent visitors to Middlebury College, where he was a trustee from 1884 to 1888. He also held frequent parties at Shard Villa. At one lavish event in 1875, he entertained more than 100 of his neighbors at a dinner. All the while he stayed active in business, acquiring property and constructing buildings both in Vermont and around the country. His wealth was evident in his winter trips to Florida. And he never lost his eye for an opportunity. He built the Columbus Smith Block as a center for businesses in Middlebury (later destroyed by fire) and a tenement house, which he eventually willed to St. Stephen’s Church in Middlebury. And following the great Chicago fire of 1871, Smith went to Chicago where he bought and developed properties. From his globe-trotting days as legal pirate to his middle age as a local merchant, Columbus Smith seemed to have a charmed life. But that state of affairs would rather abruptly end. Continued here. Images: Photographer Don Shall's Flickr Album; Middlebury College Special Collections; Henry Sheldon Museum of Vermont History’s Shard Villa and its People Exhibit.